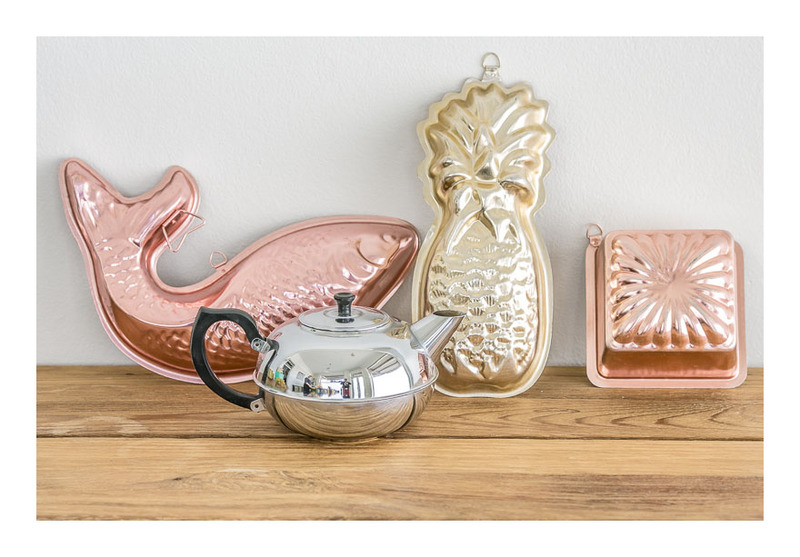 This shiny, shiny collection features anodised aluminium- three cake /jelly moulds made in Hong Kong and a teapot by Towerbrite made in Australia. Anoidised aluminium was developed in the 1920s and used for industrial products – but it really took off in domestic wares in the 60s thanks to the moon landing and all things spacey. These kitchen moulds were made in kitschy shapes – ostensibly for terrines but invariably used for cakes, blancmanges and jellies. Who doesn’t remember a large pineapple shaped jelly [red, with real pineapple chunks floating in it] at their sixth birthday party? When not in use, the moulds have handy little handles so they can hang up and add glamour to any kitchen. The two larger moulds [salmon and pineapple] are 4 cup capacity, and the smaller classic christmas cake-shaped mould is 2 cups. Note the copper and gold tones- that’s where that glamour comes in- the moulds have never been used and are in pristine condition. Similarly the teapot is unstained and unused.